It’s the end of the work week and we are ready for the weekend! Our challenge? Fill the next 48 hours with local fun and excitement. 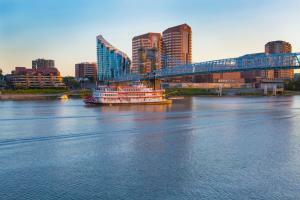 BB Riverboat cruise – Kick off the weekend a little early. Enjoy the scenic view of both sides of the river and the fireworks display from the Reds stadium! Sleep in – it is the weekend after all. Need a place to stay? Check out these options. Made Local Marketplace – We cannot wait to discover some of the best locally made products from talented makers. MainStrasse Village Maifest – Celebrate the German tradition of welcoming the first spring wines and is full of arts, crafts and international foods. Take in a Reds game – Walk over the Purple People Bridge and enjoy America’s favorite pastime, including the Hall of Fame and Museum. May Festival Basilica Concert – Experience the gorgeous Cathedral Basilica of the Assumption as it is filled with song with a performance that spans four centuries of music. What a weekend this will be! The hardest part in putting together the itinerary was deciding what to do, because there are just so many options. What would you choose to do? Whatever it is, please use #meetnky so we can share in your fun.